We usually like to give newcomers a couple of ‘courtesy’ weeks after opening before reviewing them, while they get their food and service sorted. But when we got word that Island Tang, the newest concoction conceptualised by flamboyant tycoon David Tang, financed by Media Asia boss Peter Lam, had quietly opened in Central, we pounced: the ratio of restaurant seats to businessmen is so alarmingly low we felt compelled to tell our readers asap (ask any banker who works in Central and they will vouched that lunch is musical chairs between Zuma, Robuchon, Mandarin Grill and the China Club). Located on the second floor of 9 Queen's Road Central, the unassuming façade is a retro wooden door with glass panels that features a tiny cartoon character of a chef – an easy blink-and-miss. We entered bearing high expectations for Sir David, the brains behind China Club and China Tang in London, and a glance at the spacious, airy dining room immediately impressed. With antique chandeliers and ceiling fans spinning lazily above, rich wood panels with mirrors, Island Tang is a much subtler cousin of China Club. 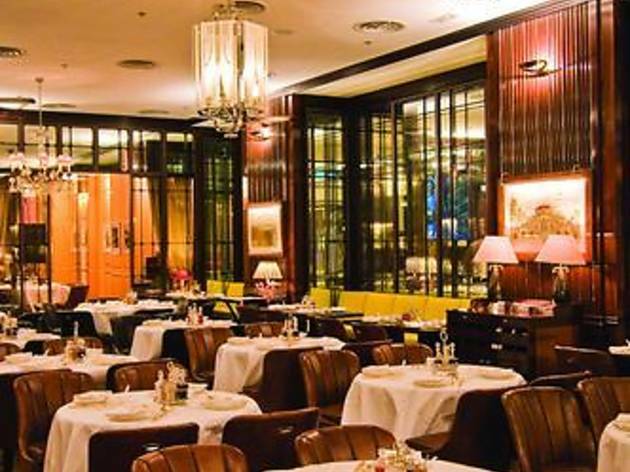 Whereas the former is reminiscent of a Shanghainese club lounge, Island Tang oozes nostalgia for Hong Kong in the 1940s. Settling down at one of the bright yellow bench seats, we noticed the details – antique condiments tray, chopsticks made with bone, silver teapots. The menu is ambitious to say the least – extensive dim sum, shark's fin, seven bird’s nest items, a range of comfort foods including congee, and even Peking duck. We had even higher expectations of the food, prepared by the former chef of Island Shangri-la. Cantonese food may be the main fare of Hong Kong – certainly the most varied and colourful of Chinese cuisine – but it's always been one of the trickiest cuisines to master. And few restaurants do everything well. We wanted to sample the full range of Island Tang's offerings so we settled on the Executive Lunch for two and rounded it out with classical dim sum. First up were staples Char Siu Bao, Har Gow (shrimp dumplings), Spring Rolls with Prawns, and Fun Gor (vegetable dumplings). While the shrimps in the Har Gow and the Spring Rolls were on the small side, the taste of the dumpling was delicate enough with a thin but chewy skin. The Cheung Fun (rice flour rolls with minced beef) had a kick from the chives. The wrap could be more luminous, but the thin texture without breakage scored points. So far, so decent. Even the Char Siu Bao, served in pairs instead of the customary triples, had a sublime filling with soft, fresh pork instead of the usual dried, left-over stuff. We continued with the executive lunch, which proves to be one of the best value fine dining sets in Central. Its $398 price tag buys you a dim sum selection, a bowl of shark's fin with shredded chicken, a choice of three stir-fried dishes from an extended menu, rice wrapped in lotus leaf and dessert of almond soup with egg white. While we wish we could spring for the ultra-decadent Hai Fu shark's fin in brown sauce for $688, the bowl of shark’s fin we had was excellent. The rich brown soup was savoury, flavourful from the generous use of superior stock and easy to swallow (no liberal use of corn starch as a thickener like the cheats). There was just a small amount of shark’s fins swimming in the soup but they were of the thick needle-like quality. The use of fine cognac in the soup left a pleasant aftertaste, so that we skipped the usual accompanying vinegar. With our stomachs half full, we went on to try three home-style dishes as our main. The stir-fried beef with black pepper sauce had a nice kick, and the meat, although not the premium rib-eye cube steak used in some fine restaurants, was tender. The scallops with bitter gourd was large and succulent, and my personal homemade favourite, minced pork with preserved turnip in egg batter, was shaped and sliced like a pizza for easy sharing. The fluffy texture reminded us of the Korean pancake Pajeon, while the crunchy turnip was diced into tiny pieces. The rice wrapped in lotus leaf was probably the most lacklustre, the rice lacking the fragrant aroma and steamed with little stuffing. And while we are at it, the Shao Mei tea was also too weak, even when we poured after infusing for 10 minutes. The service seems attentive enough for a new eatery. Waiters kept their eyes on the customers and walked swiftly and quietly. Response time was quick, less than 20 seconds, although the dining room was only half full at the time. We will need to review the more complicated classic offerings like Buddha Jump Over the Wall, the steamed garoupa and the crispy skin fried chicken to offer Island Tang a final verdict. 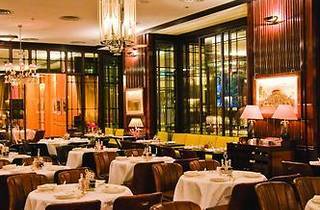 But for lunch, the restaurant’s solid quality and luxurious décor will no doubt pack crowds once word gets around. Shop 222, The Galleria, 9 Queen’s Rd, Central, Central, 2526 8798. Daily Noon-10.30pm.